This beetle is a Ponderous Borer. No, I am not criticizing its social skills, although it didn't have much to say as I took its picture. It is "ponderous" as in "huge". 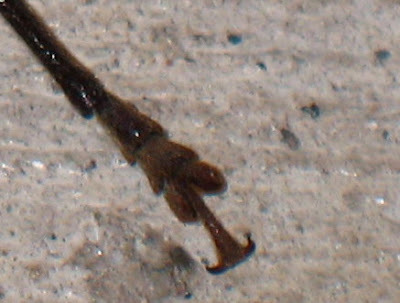 You can't tell from the photo (I should have put a coin next to it), but it is about 2 inches long not including the antennae. The "boring" part refers to the larvae of this beetle, which bore through the wood of dead and dying trees. These beetles like pine trees, so they are sometimes called Pine Sawyers. But I would call what their larvae do "boring" more than "sawing", so "sawyer" is misleading. Coincidentally, they especially like Ponderosa Pines. "Ponderosa" is Spanish for "ponderous", as in "that is a ponderosa steak", or "that is a ponderosa ranch". This particular beetle was crawling on the sidewalk in a small strip mall in Lake Tahoe. That is not normally where you would find a beetle that loves trees, so I think this one was ill. He had two types of growths or abnormalities on his exoskeleton, the yellow and white pus in the middle of the photo below, and the shiny spot surrounded by white pus at the bottom right. Here is another closeup that is not so gross. This is his tarsus (foot), showing the hooks that allow him to climb tree bark very well. If you are into really gross insects, you will want to check out this photo of a Ponderous Borer larva being held in a man's hand. It is a 3 inch long grub as thick as your finger. If Thomas Jefferson had known about the Ponderous Borer, he could have used it as further evidence of the superior vitality of New World species. Wow, that's cool. Is that guy native to your area? 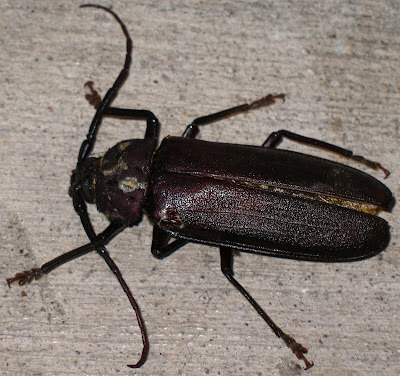 I've read about invasive species like the Asian long-horned beetle, which will wreak havoc on trees. He is not native to my area (New Jersey), but he appears to be native to where I found him (California). I did not see him listed on a couple of invasive species databases I checked, under his scientific name Ergates spiculatus. By the way, there are other types of Pine Sawyers that live in the east which I have also seen (Monochamus spp). Their bodies are not as long, but they make up for it with very long, curling antennae. 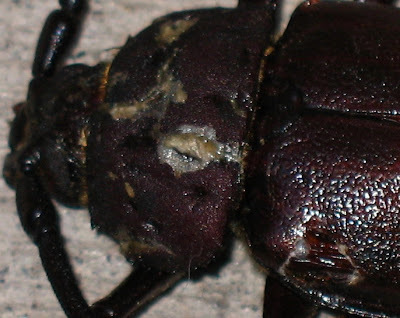 Beetle pus: fairly gross. Nice picture of it, though. It's a nice intact specimen even if a little damaged. Wonder if the wounds resulted from someone trying to make it their supper? @Joy K - It always seems to be the gross stuff that catches my attention! @JSK - I'll bet you are right. The pus is probably due to wounds, which would most likely be caused by fighting off something that was trying to eat it! That's me getting a drink from a very old water fountain in Italy. I love to cycle, hike, canoe, camp, and otherwise be outside. During the day, I am a safety engineer for an insurance company.